This solid black tungsten ring is called the Marvo - meaning Black in Greek. This 8mm tungsten ring has beveled sides that are polished and two grooved lines in the middle that is solid black. 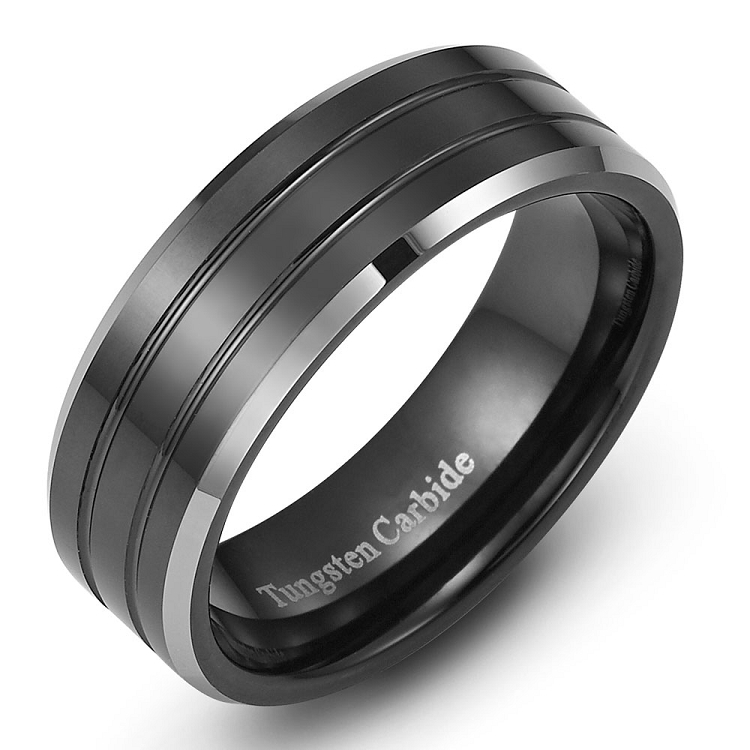 Q: Since this is a solid black tungsten ring, can it be engraved? A: Absolutely! In fact, the engraving shows best on the black tungsten rings. Was this answer helpful? 24 of 26 Customer(s) found this Answer helpful. Q: The black rings look very sharp. Is the black a coating on the Tungsten? Will it wear or fade? A: The black tungsten will not fade, chip or tarnish. If it ever does, we will replace it. Thank you! Was this answer helpful? 22 of 25 Customer(s) found this Answer helpful. Q: Can these rings be sized or do you have to by the one that fits? A: Hi, Tungsten Rings can not be sized. If you need to get a new size, we will exchange the ring for you. It is very simple. Hope this helps! Q: Do the rings have tungsten ... Engraved inside ring ? A: Each of our rings are stamped with 'Tungsten Carbide' inside the ring. I hope this helps! Thank You, TF! That would just be the reflection or photo of the ring. This ring is a true black ring. Just as black as any other black rings we sell. Hope this helps! Q: is this ring for a man or a women....or it doesn't matter? Q: Are the edges of this ring a beveled silver color? It's hard to tell from the photo If the edges are black or silver. Thank you. It is exactly like the picture. My fiance loved it. I can't wait to surprise him with another ring for Christmas. Brought the ring for a friend that was getting married. Had to get a new size and it worked great. easy exchange process and the ring is magnificent. This ring amzing. I love it and it fits perfect, really good looking for a mans ring! This was the first Tungsten ring I ever ordered and it is Beautiful. It arrived in a timely fashion and is absolutely stunning. I just love this ring. Its so smooth, looks nice and I get alot of complements. I will be ordering more for sure. Great service from Tungsten Fashions. this ring is amazing , It is more than I expected I highly recommend this ring ! The craftsmanship of the ring was what I was really looking for. The design was really nice too! Tungsten Fashions customer service is outstanding. This ring looks great on your finger! The style and quality is very good. I am totally satisfied with this ring! THE ITEM WAS SENT TO PROMPTLY!!!! THE RING LOOK AND FELT AMAZING!!!!! I WILL PURCHASE MORE ITEMS IN THE NEAR FUTURE!!!! LOVE VISITING THE SITE AND I LOVE THE ITEMS!!!!!! I ALWAYS WANTED A THUMB RING AND I GOT A RING THAT IS STYLISH AND CLASSY!!!! Purchased this ring as a gift for our son. When it first arrived it was a great looking ring, however it was too large. The customer service was very friendly and helpful when it came to exchanging it. Size actually fits, ring is very durable and doesn't scratch easily.